Our time matrix was formed 950 billion years ago from one of the 24 Breneau Orders. It divided into three hominid life forms which entered our time matrix: Elohei Emerald Order (cat-like); Seraphei Gold Order (bird/reptilian); and Braharama Amethyst Order (cetacean: whale/dolphin). All three were of dimensions D10 to D12. All made a contract (agreed upon) to uphold the Law of One and create peace and equal rights for all. After billions of years, slight digression occurred amongst some of the Elohei and Seraphei to a level designated by Elohim and Seraphim. The Elohim decided to pursue a genetic experiment of interbreeding with the Braharamas, and went ahead in spite of advice against this from higher levels, such as the Breneau (and then so did the Seraphim). FALL 2. The Annu-Elohim requested agreement/permission from higher levels (Breneau) to wipe out the troublesome Annu-Seraphim. It was rejected. As a result, the Annu-Elohim severed the dimensional connection between D11 and D12 so that beings above D12 could not interfere (the Annu-Elohim were at D11). This caused degrees of fall for many races, and has been passed down and become known as the 'Original Sin'. FALL 3. 360-350 billion years ago Andromeda galaxy partially degenerated due to an earlier event (about 430 billion years ago) involving an adjacent time matrix inhabited by the advanced Borenthasala race. The latter conducted a gigantic experiment exploring victim/perpetrator relationship (they had no experience of this kind of negativity) and were puzzled as to how another, adjacent time matrix completely degenerated. The Borenthasala race divided into three groups, playing alternate roles: controller overseers, victims (hypnotised), and perpetrators (hypnotised). However, it was a disaster. One group, named the Bourgha, after playing the role of victims, remembered (now as perpetrators) what was done to them (as victims), and destroyed the victims before the controllers could step in. But when the latter did attempt to wake up the Bourgha out of their trance, they couldn't, and were similarly destroyed. Thus the Bourgha is now an aggressive hostile race of its own making. As a result, the Guardians created a time wall around their time matrix (quarantined them). However, the Bourgha constructed a time rip machine which created a wormhole effect to enable them to escape, but which extended to disturb the neighbouring galaxy, Andromeda, causing regions to fall. Furthermore, within Andromeda galaxy the star Procyus fell (due to an attack from the Wesedak races). Procyus eventually manifested as Procyak at the core of our Milky Way and, in fact, initiated the formation of our Milky Way galaxy (and thus the Milky Way is also named Procyak). Other stars continued to fall from Andromeda, becoming part of the Milky Way, such as Sagittarius A, and a portion of Procyus became Procyon (Canis Minor); another portion became Prolaris, later known as Polaris (North Star). 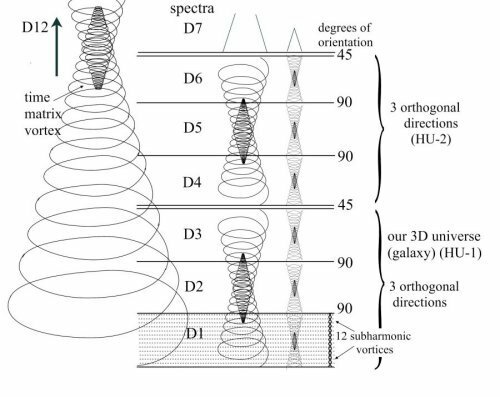 Frequencies reduced, and matter/energy gradually imploded into inner space but being restructured through its existing morphogenetic field to form a similar holographic fractal offshoot in the form of our Milky Way galaxy. Our Galaxy thus materialised 2.4 million light years away as per 3D measurements. However, in inner 4D space, this was just below Andromeda---according to the Guardians the Milky Way is at a rotation from Andromeda of 15 degrees in 4D space, with a common axis between the two galaxies, where Earth is closely located. 250 to 150 billion years ago the Guardian founder races entered the appropriate systems and reset the Divine blueprint to restore the link D12 to D11, which had been severed by the Annu-Elohim described in Fall 2 above. FALL 5. Fall of Metatron 150 billion years ago. One of the collective gestalts known as Metatron hosted a massive mission to rescue its individual lifeforms/beings in the lower dimensions, which had succumbed to the programmes/implants from the astral plane dimensions where they had become entrapped. The mission involved Metatron sending in further representations (portions of itself) to attempt to free them. Other collective gestalts warned against such an endeavour but nevertheless Metatron pursued the mission. It failed. A wormhole matrix was formed, which connected to Procyak at the centre of the Milky Way, and more than 50% of the Metatronic collective was pulled in, causing the remaining portion to fall, initiating the formation of the Phantom Matrix, an 11-dimensional blackhole sub-time distortion cycle within our time matrix in the astral dimensions. Fallen entities, which even for a spiritual existence (no corporeal dependency) have to be parasitic to prolong their existence (hence the expression 'stealing one's soul'), suffer severe DNA reversals. As a result of the magnitude of this fall, the fallen members developed an artificial reality, which to this day inflicts its distortions on the natural harmonic order of Creation, such as altering the spin values of the counter-rotating vortices underlying all manifest forms, to match their unnatural system. FALL 6. Thus there was a partial fall of the Milky Way, 150 million years ago. The Milky Way was now vulnerable with its blackhole, and endured further degeneration, in particular, from further attacks from the invader races to pull more of it into the astral dimension using advanced scalar technologies, imploding the portions of our galaxy into the Phantom Matrix. This astral Phantom Matrix became the basis for the religious Hades or Hell worlds; it also contains a fallen Earth, known as Phantom Earth. The Guardians installed a time wall around our time matrix to prevent the rest of it falling into the Phantom Matrix. Our Galaxy will implode into its blackhole in a few million years. In about 1000 years our solar system will Nova but Earth is now in ascension status and will ascend out of the solar system by around 900 years (remember all such systems are multidimensional and these processes take place internally, at a higher causation level). FALL 7. 556 million years ago many digressions were occurring on Tara (Christian 'Heaven'); an upper fractal Earth planet of a higher degree of order, D4, D5, D6. The Breneau Collective made a restatement (reminder with action) of the contract by creating the human race (then named the Turaneusiams) as guardians and keepers of interplanetary relations and security. Factions of non-benevolent races objected, and over thousands of years brought about genetic contamination on Tara between certain races, causing further degeneration of consciousness. As a result, a more digressed group, the Alanians, experimented with harnessing the energy from the centre of planet Tara. They were warned, but the anticipated result was an implosion, destroying many citizens (some left the planet), and fragmenting the DNAs of much of the human souls, who became lost souls suspended between dimensions. A massive programme was introduced to restore the Turaneusiam race in which volunteer Cloister races combined their consciousness with the human fragments and incarnated on Earth to rebuild the DNA one strand at a time. These were called the Root Races. Each group (in sequence) restored a specific DNA (double) strand which was then stored in the Sphere of Amenti. (This was much later protected by the fortification of the Great Pyramid .) As the genome was restored in the Sphere, humans picked up the DNA strands from the Sphere and returned to Tara. In effect, the Sphere contained potentially much of the collective of the human race. Planet Earth, however, had to be reseeded here in 3D, which took about 300 million years for the surface to be inhabitable for plants and animals. As the human race progressed through the Root Race system, the Anunnaki agenda of destroying the human race continued. There was another fall; now on Earth. FALL 8. 5.5 million years ago the human civilisation had advanced technologies and the fall came about as a result of the so-called Electric Wars. Human evolution was destroyed again due to conflict with the Anunnaki. A second seeding of Earth was prepared and the human race again evolved. FALL 9. 848,000 years ago there was another fall, due again to interference from the Anunnaki. This was caused by the 1000-year wars. The Continent Lemuria in the Pacific was destroyed around 50,000 BC; caused by the invasion of the Dracos (human-Drakon hybrid) who claimed Earth as their rightful heritage, but the Sirian guardians, assisting humans to rid Earth of the Dracos, underestimated the power of the crystal generators when applied underground, causing a chain reaction and the destruction of Lemuria. Next, Atlantis partially sunk around 28,000 BC leaving the three islands, Bruah, Noah, and Lohas, which was caused by the Anunnaki's misuse of the crystal generators---creating the power of about ten atomic bombs---to force open the Inner Earth force-field portals)  in their quest (original Holy Grail) to access the Universal Templar Complex for the assimilation of our galaxy (time matrix). We are now well into the third evolution of the human civilisation on Earth and close to another (repetitive) fall, except that this time people are waking up and it will not happen (some individuals will of course go into 'fall' in their next life). 1. Book: The Emerging New Science. 2. Voyagers vol. 2, and Fall of Man articles. 3. Book: The Original Great Pyramid. 4. Books: Engaging the Extraterrestrials and Voyagers vol. 2. 5. Articles: Fall of Man. 6. Article: Arc of the Covenant, and book: The Original Great Pyramid.